39 year old female presents to your Emergency Department with a four day history of a gradually worsening headache. Whilst she has a past history of migraines, this headache is much more severe and of different character to any migraine she has had previously. She takes regular triptans for her migraines & also has a contraceptive vaginal ring in situ. She has no known allergies. On examination she is slightly drowsy, has difficulty following commands & is unable to form complete sentences. Her observations are as follows; P 110, BP 140/88, afebrile, SaO2 98% (RA). Cardiorespiratory examination is unremarkable. She has no focal neurological deficits, specifically unremarkable cranial nerves & full limb strength with intact reflexes and sensation. Her gait is not assessed because of her drowsiness. What are your differential diagnoses in this case ?? What are you doing to do next ?? Basic laboratory investigations are unremarkable. – Na 142 / K 4.3 / Ur 8.4 / Creat 76. Upon returning from the radiology department, our patient has had an obvious deterioration in her neurological state. She is now obtunded with fluctuating periods of agitation. Within minutes she has a generalised tonic-clonic seizure !! Despite several doses of midazolam she continues to have short-lived seizure activity and requires intubation for airway protection and optimisation of ventilation. Thrombosis of the dural sinus and/or cerebral veins (CVT) is an uncommon form of stroke, usually affecting young individuals. Despite advances in the recognition of CVT in recent years, diagnosis and management can be difficult because of the diversity of underlying risk factors and the absence of a uniform treatment approach. It represents ~0.5-1% of all strokes. 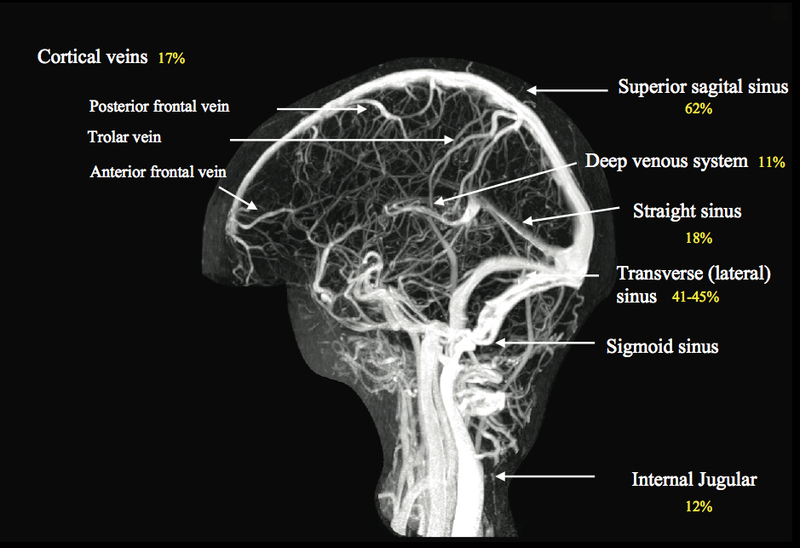 Cerebral venous anatomy & sites of thrombosis. Focal brain injury from venous ischaemia/infarction or haemorrhage. Patients typically present with a combination of these features. Headache is the most common symptom in CVT (~90%). Can be sudden & severe (“thunderclap”) or migraine-like. Isolated headache (without neurology or papilloedema) occurs in ~25% of cases. 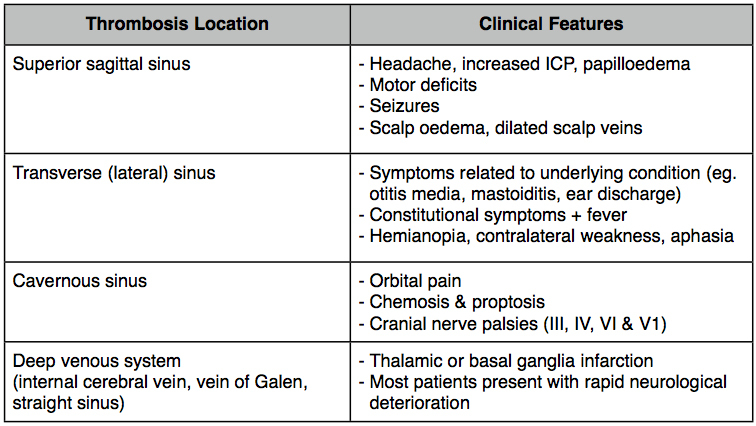 Clinical features are often dependent upon the location of the thrombus (see table below). There are no specific CSF abnormalities in CVT. Opening pressure is elevated in >80% of cases. Elevated cell count & protein is also often seen. A normal D-dimer may be considered to help identify patients with low probability for CVT. However, a normal D-dimer should not preclude further evaluation in patients with high-suspicion for CVT. Non-contrast CT scans are abnormal in only ~30% of cases. 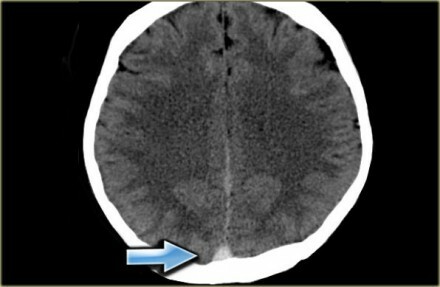 The primary abnormality on a non-contrast CTB is hyperdensity of a cortical vein or dural sinus. 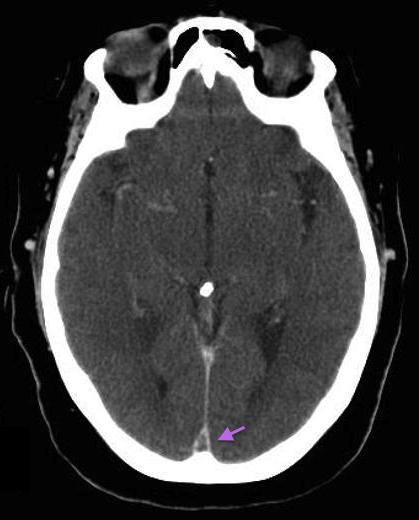 Thrombosis of the posterior part of the superior sagittal sinus may result in a dense (or filled) delta sign (see below). An ischaemic lesion that crosses usual arterial boundaries (or within proximity to a venous sinus) is suggestive of sinus thrombosis. 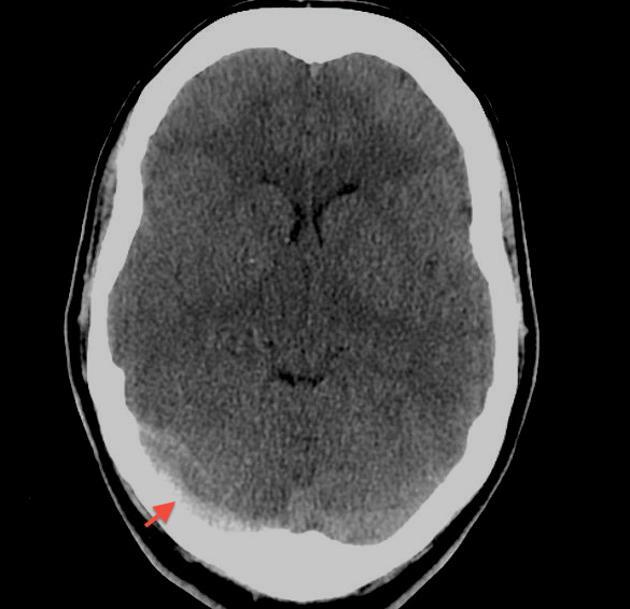 Intracerebral haemorrhage occurs in up to 30-40% of patients with CVT. They often have prodromal headache or bilateral parenchymal abnormalities. 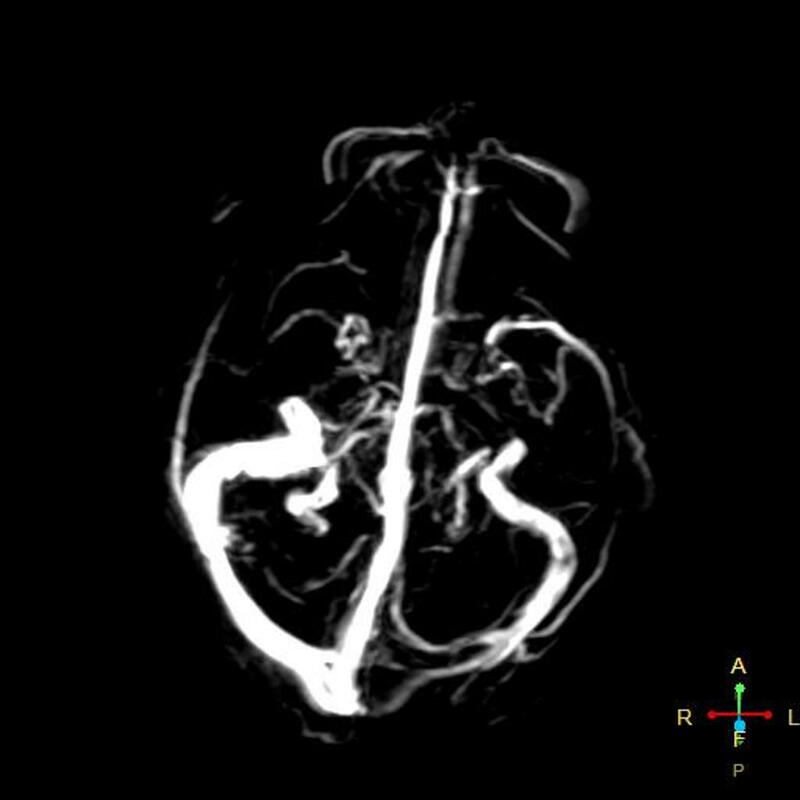 This may demonstrate a filling defect within the cerebral veins or sinuses known as the empty delta sign (see below). More useful in subacute & chronic disease states. More sensitive than CT at each stage after thrombosis. Findings are variable depending on the age of the thrombus. CT vs MRI in the Diagnosis of CVT – adapted from Saposnik et al (2011). (1) Admit to a Stroke Unit. Aim: prevent thrombus extension, facilitate recanalisation & prevent DVT/PE. No data to support one over the other for Mx of CVT. Aiming for INR 2.0 – 3.0 for 3-6 months in most cases. For advanced interventions – see below. (3) Seek + Treat Precipitating Causes. This includes bacterial infection (mastoiditis, meningitis etc) with management focusing on antibiotic therapy & surgical drainage of purulent collections. If hormonal therapy if thought to be the culprit; remove the source if able. (4) Detect + Correct Complications. Management may include medical therapy (eg. acetazolamide), lumbar puncture, optic nerve decompression or shunts. Decompressive craniectomy may be required in the setting of neurological deterioration due to severe mass effect or intracranial haemorrhage refractory to medical therapy. Occur in up to 37% of adults (& ~50% of children) with CVT. Anti-epileptic drugs are recommended following a single seizure (without parenchymal lesions). 9-13% of patients w/ CVT have poor outcomes despite anticoagulation. Recanalisation rates may be higher with thrombolysis, however this is reserved for cases of ongoing deterioration despite anticoagulation (or with increasing ICPs). One small systematic review (169 patients) showed possible benefit of localised thrombolysis in severe CVT. Carries a higher rate (17%) of intracerebral haemorrhage. Various devices available; evidence is largely anecdotal. Reserved for cases of refractory intracranial hypertension. 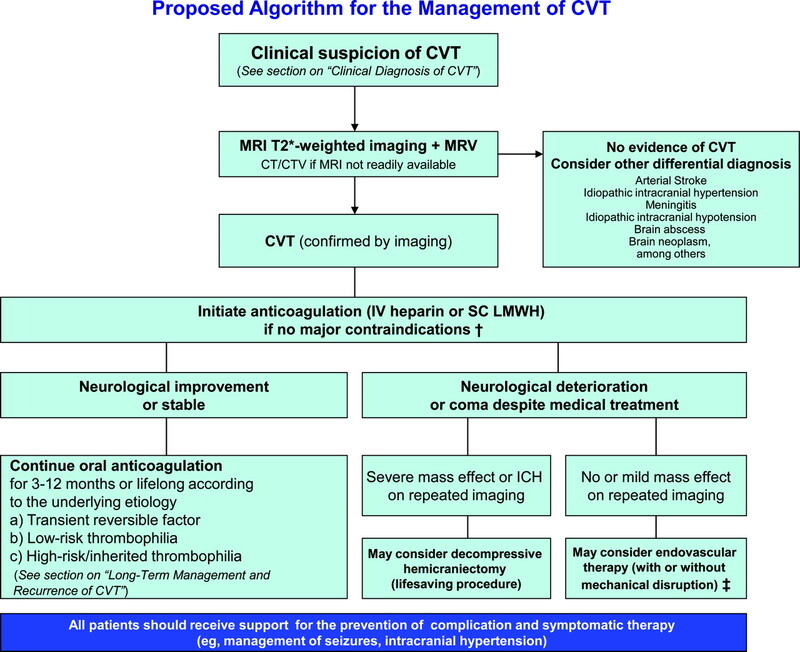 Algorithm for Management of CVT ** from Saposnik et al. 2011. With her CT demonstrating extensive sinus thrombosis, our patient is commenced on a heparin infusion before heading to Intensive Care for ongoing management. Following extensive thrombophilia screening it is thought that her contraceptive ring was the culprit. Despite having a rocky inpatient course she is eventually discharged home without neurological deficit with ongoing anticoagulation (warfarin) and levetiracetam for seizure control.